The Asus Zenfone C has been made official and just like the Samsung Galaxy J1, the Zenfone C is also a major threat to the entry-level space with its rock-bottom price standpoint and legit feature set which you will know right after the fold. The Zenfone will hit Southeast Asia, specifically Malaysia, next month with USD 97 price. It is pegged to be the successor of the budget-friendly Zenfone 4. The handset's design philosophy and specifications have a big resemblance to the latter; however, we did see some upgrades in the Zenfone C's recently leaked specifications. Asus is an international brand and there's a quality tag that goes with the name. If you're in the market for an entry-level handset; but too picky to choose local brands, this could be your option. So like what I've said, the Zenfone C comes with the same melting pot as the Zenfone 4. However, it is very note-worthy that the former comes with a 4.5-inch display with an FWVGA (480 x 854p) resolution. It also boasts a dual-core Intel Atom Z2520 CPU which is clocked in a 1.2-gigahertz speed. There's a capable 1GB of RAM to aid the processor with the device's multitasking activities. There's also the 8GB internal memory for your multimedia files. And in case you'll need more space (which probably you will), there's the microSD card support of up to 64GB on top of the free 5GB Asus WebStorage (with an additional 11GB on the first year). On the camera-front, you'll have both the 5-megapixel rear shooter with LED flash and the VGA front camera. There's also an EIS feature for those planning to take stills in lowlight. Battery has also been bumped to 2100 mAh (from 1600 mAh of Zenfone 4) giving the newcomer a longer mileage. The device will be powered with Android 4.4 right off the bat and it will be available in Black, Red and White hues. 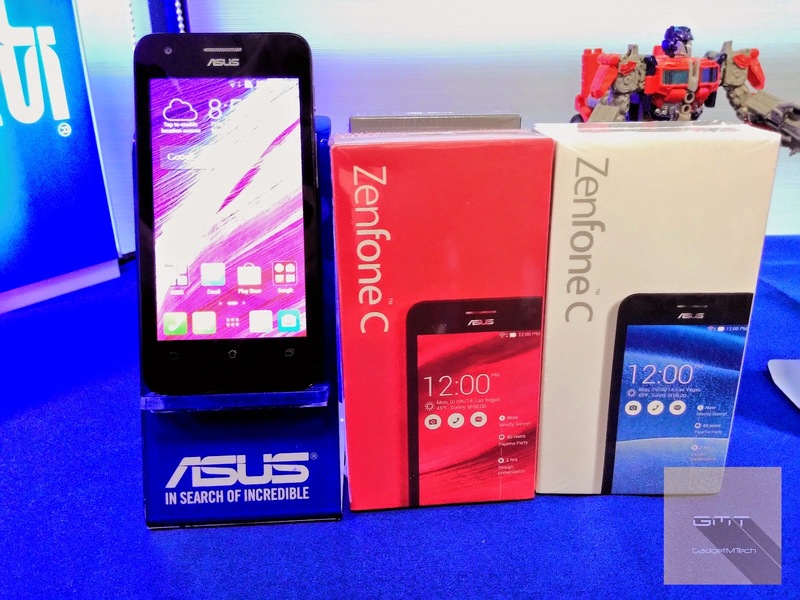 The Asus Zenfone C is also expected to come in the Philippines and the rest of the SEA region soon.